The iMac has now been around for 20 years, and 9to5Mac’s Michael Steeber documents its history from the original Bondi blue model (see “Welcome, iMac!,” 6 May 1998 and “iMac Hoopla,” 17 August 1998) to the current iMac Pro (see“Apple Releases the iMac Pro,” 15 December 2017). In many ways, the original iMac was the key to Apple’s revival. At a time when Apple’s finances and product line had been out of control, the iMac occupied what was arguably the most important slot in Steve Jobs’s simplified four-cell product matrix (see “Apple Hardware Strategy: Alluring PowerBooks and iMac,” 11 May 1998). Despite that, the original iMac did wonders for Apple’s financial results, even if the then-amazing $106 million in quarterly earnings pales in comparison with the billions Apple makes on the Mac each quarter now (see “iMac Propels Apple to $106 Million in Earnings,” 14 October 1998). Good story, Josh. Thanks… hard to believe I’ve lived through it all. Amazing. 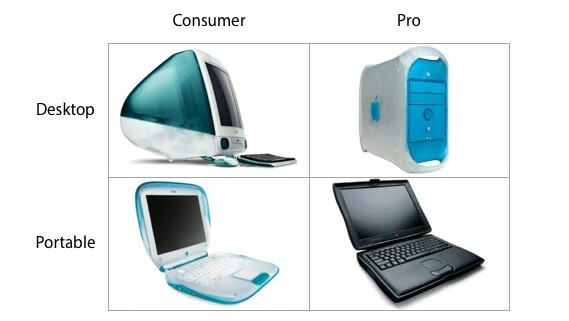 Reading through the iMac history and how Steve decided to restructure the Mac after Apple almost tanked. Watching the iMac unveiled, the focus on key points. Simply outstanding. It’s hard to see all that now and not realize just how much I miss Steve’s Apple. Simon, IIRC, what became the iMac was already under development BEFORE Steve’s return. Fortunately it was THE project that caught his fancy and he championed it. Bruce Tognazzini literally wrote the book on Mac interface guidelines. It is so unfortunate that it seems to be mostly abandoned. That is, in my opinion, why Macs are a lot more difficult to use than the early ones. Hopefully Apple one day will revisit it and do a better job of following it. I feel that I have a voice in this opinion as I once worked in a cubicle near his and still own a copy of the book. There was a new Mac in development before the return of Steve, that did not have plans to have a modem built in to it, and was not based on the BSD UNIX system Steve brought with him from NeXT. There was a lot of TidBITS Talking going on at the time of the great return about the next new system, Open Doc, which everyone had to prepare for even though the system was going to be a knockoff of whatever MS was using, and was clearly such a mess it was delayed many times, over the course of at least 2 years. There were no beautiful colors planned for the new Mac or distinctive gumdrop shape, and it was not geared towards either families or businesses. It would not have been any easier to use or configure than Windows. And since Pagemaker, Quark, Photoshop and other graphic apps were about to be ported to Windows, Apple could have lost its advantage in graphics and design. Even more critical, it was announced that Professional film and motion applications Avid and Premier would not be developed for Mac. OSX enabled the rapid development of Final Cut Pro, which enabled Apple to claw back in to a critical business segment. Whatever the Open Doc Mac would have been, it did not have the internet built in to it, and would not have been anything “i.” But a downside was that iMac made Adam’s wonderful Internet Starter Kit unnecessary, and without it, we never would have been able to get wired in prior to iMac. The name iMac didn’t even exist before the return of what became known as the iCEO. The name iMac was actually coined by a creative director at TBWA Chiat/Day, the ad agency that created what is still considered by many to be the best TV commercial of all time, “1984.” This agency was fired by Apple when Steve was. Steve brought them back to do what evolved to be the now classic “Think Different” campaign. Before the return of Steve and the “1984” ad agency, the theme under discussion for the many times delayed new Mac was “We’re Back.” Just about everything related to Apple and the Mac that never could get off the ground just screamed “looser” in every way. And I remember on the then new TidBITS Talk everyone, including me, was going absolutely crazy about how wonderful iMac was going to be. And it was, and still is.